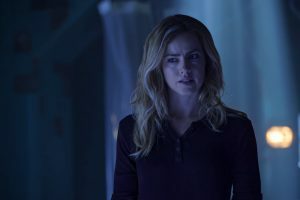 12 Monkeys wrapped up its epic story this evening, and yesterday I had the chance to speak one last time with Amanda Schull about the finale. The Witness was finally defeated, and after Cassie couldn’t quite pull the trigger on Olivia back in “45 RPM,” she had no trouble at all when the second opportunity presented itself. On the heels of a monster, no holds barred throwdown, Cassie shoved Olivia into the time stream, condemning what was left of her to become that mysterious skeleton discovered by Leland Goines. 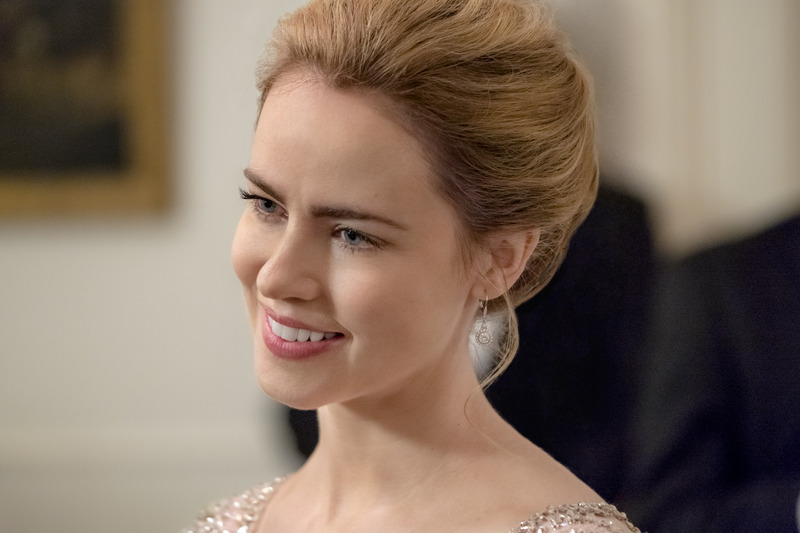 Schull says Cassie getting to be the one to kill Olivia was the satisfying culmination of a season-long quest. “Every season, each of us has had a purpose. 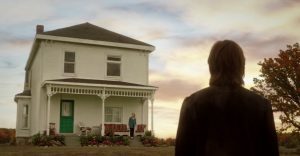 Cassie’s purpose with Season 3 was finding her son and saving her son, what turns out to be an attempt to save his soul because she isn’t able to save him. This season kind of turned into hunting down Olivia,” she explains. Like so many of us, myself included, Schull never expected Olivia to be that skeleton, and says the mechanics of bisecting Olivia were both comical and unnerving. “I thought the skeleton was James. 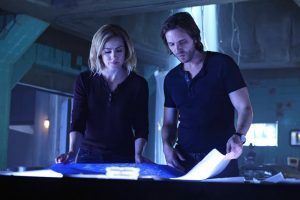 I don’t know whether Terry [Matalas] intended it to be him at some point, because he did have a reaction when he was near it [back in Season 1],” she says. 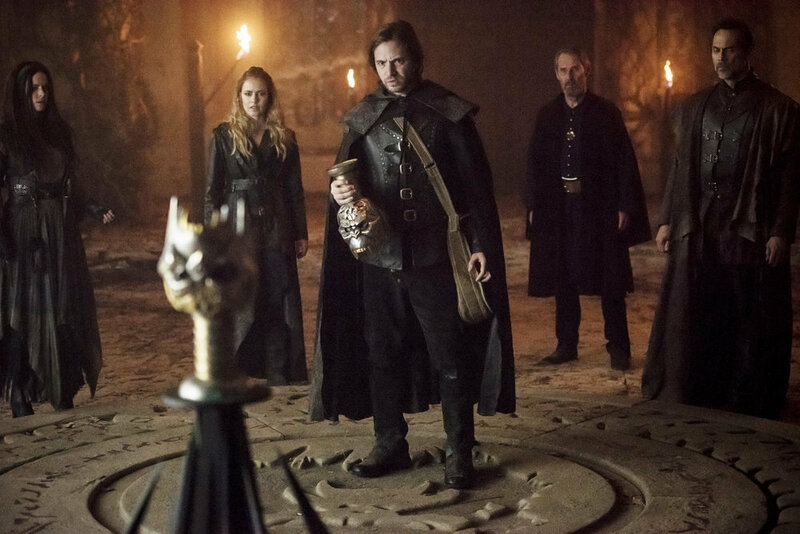 Despite the emotional impact within the story, losing Deacon didn’t hit the cast as hard given that they were shooting episodes in blocks, concurrent with one another, but the moments later in that episode, where Cole is nearly beheaded, were the last scenes filmed for the series. “It’s interesting. Maybe on another show, if we shot linearly, it would have affected us more. But some days we were shooting three or four episodes at a time. Conceptually, we understand that he’d be gone, but we were shooting so many episodes simultaneously that he never left. Much like time itself, we were never really going in one direction. We were all over the place,” she points out. When Cole is seemingly about to die, Cassie rises to meet his gaze but he can’t hold hers. Schull explains that part of that was scripted and part was choice. “His reaction was scripted, I think. Mine was not, I think. When we did it, that was the last day we were working together at all. That was my final scene with Aaron [Stanford],” she says. Schull adds that before they left Toronto for Prague, the cast were able to properly close out their journey on that set. “They did try to honor our goodbyes to the time machine when we were all splintering out. That was supposed to be the last day we were shooting in Toronto,” she says. One of the wink nudges about the finale is that we don’t see the clock stop when Cassie shuts down Titan, so we can go either way on whether she actually did. Schull says she and Matalas had many discussions about it. “On the day we shot it, he intended for her to stop it. I don’t know what was decided afterward, whether the ambiguity was intentional. Terry and I discussed that because it was supposed to be down to the very end. It’s supposed to be that Cole is pleading with her,” she recalls. Schull says that once she’s returned to her timeline, Cassie remembers pieces of her love story with Cole as if through a veil, and when Cole finally finds her, she believes all of the memories fill in, but since there’s a wink to the audiences with the fringes of red leaves around the frame, we don’t get a super close-up to see that happen on their faces as they embrace. “It was always subject to interpretation. Are they living in their perfect moment? What does that mean? Everybody is living in their happily ever after, but is that their perfect moment that has been established by the red forest? You see the red leaves creeping in at the very end so it’s a little bit subject to viewer interpretation,” she shares. There’s no formal clock on how long Cassie waits for Cole to arrive, but Schull guesses it’s close to a year and says the memories are just beyond her grasp. “There is something that she can’t quite put her finger on. Like a memory of a dream, a deja vu,” she says. 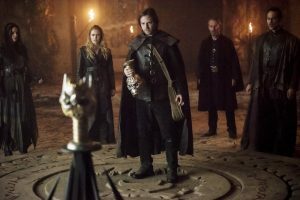 Schull was pleasantly surprised by the finale and its happy endings. “I didn’t know how any of the stories were going to finish. I think Terry kept some of that pretty close to the vest. I knew it was always going to be a love story, but I didn’t know how it was going to be a love story,” she says. 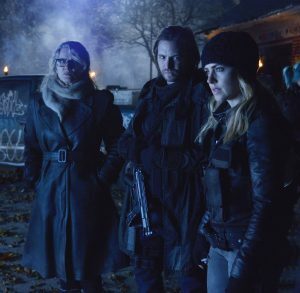 12 Monkeys is available for streaming on Syfy.com and hulu. Thank you so much for spending four seasons with us. If you missed any of our coverage, it’s all here.